On Tuesday, October 13, ABC's primetime reality show, 'Shark Tank', caught up with Tiffany Krumins, inventor of Ava the Elephant. In the follow-up segment, FLAVORx, a Columbia, MD based pharmaceutical company, was featured as a potential business partner for Krumins and Barbara Corcoran, her 'Shark Tank' investor. I contacted Tiffany to discuss ways that FLAVORx could partner with her and Barbara on Ava, which led to them filming a meeting at our office. FLAVORx, the nation's authority in medication flavoring and palatability, was featured alongside Tiffany Krumins, inventor of Ava the Elephant, on a recent episode of ABC's "Shark Tank". Krumins and her "Shark" investor, Barbara Corcoran, met with representatives of FLAVORx to discuss possible business ventures. Their meeting was filmed for inclusion on a follow-up segment of the show, which aired Tuesday, October 13. "We watched Tiffany and Ava on the first episode of Shark Tank and immediately realized how well our two products go together," says Chris Cielewich, VP of Sales at FLAVORx. "I contacted Tiffany to discuss ways that FLAVORx could partner with her and Barbara on Ava, which led to them filming a meeting at our office." FLAVORx supplies over 40,000 pharmacies across the country with products they use to improve the taste of liquid medicine. Using FLAVORx flavors, pharmacists are able to give children a choice for how there medicine will taste, making the experience of taking medicine much easier for kids. 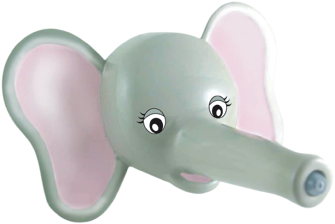 Ava the Elephant is a novel and effective way to help children take their medicine as well. By disguising the standard medicine syringe or dropper in a friendly elephant's trunk, children are more likely to take their medicine without a struggle. "We get excited about anything that helps children take their medicine so they can lead happy, healthy lives. That's why we are so attracted to Ava the Elephant," said Stuart R. Amos, CEO of FLAVORx. "Combining better tasting medicine with a fun way of delivering it is a big win for parents and children." FLAVORx has been helping people take their medicine since 1994. The FLAVORx Pediatric Flavoring System is available in nearly all chain pharmacies, including CVS, Walgreens, Walmart, Target and Rite Aid, and many local independent pharmacies--over 40,000 locations in all. Using FLAVORx's copyrighted flavoring recipes, pharmacists have safely flavored more than 35 million prescription and over-the-counter medications, making it easier for children to take their medicine and for parents to give it. Pill Glide, FLAVORx's newest product, expands their adherence-based offerings and continues the company's mission of improving lives and health-related outcomes through higher medication adherence. For the latest company news, as well as information and tools related to medication adherence, go to the FLAVORx website or follow FLAVORx on Facebook.